The American Herbalists Guild is embarking on a search for the next Editor of the Journal of the American Herbalists Guild (JAHG). The position requires at least three years of experience working in journalism, publishing or some comparable literary position along with a proven track record in editing, writing, digital publication, and managing editorial duties. Knowledge of the field of herbalism would be an asset to this position. The current JAHG Editor is retiring from her role and will mentor the selected candidate as necessary to ensure a successful transition. The ideal candidate will begin shadowing the current editor in July, co-editing the October 2019 issue of the Journal. The new JAHG Editor’s first independent issue will publish in the spring of 2020. 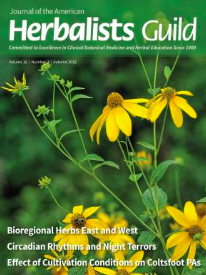 The biyearly Journal of the American Herbalists Guild promotes, reports and educates on all aspects of therapeutic herbalism, especially those that emphasize the clinical, historical, and professional application of botanical medicine. The Journal is relevant to practitioners, students and teachers of herbalism, and those who manufacture, market and dispense botanical medicines. Browse some of the archived JAHG issues and sample articles here. Compensation: An Honorarium of $3,000 per issue upon successful publication. If you meet the requirements and believe that you are well-suited to the role of Editor, please submit a CV and cover letter by May 15, 2019. Click here to download our official press release.